Growth at a very reasonable price. Occasionally, a growth stock falls out of favor. When that happens, the stock may start looking more like a value stock, even though the above-average growth potential is still there. Three of our Motley Fool contributors think Cypress Semiconductor (NASDAQ:CY), Skechers (NYSE:SKX), and Teva Pharmaceutical (NYSE:TEVA) fall into this category. Here's what you need to know about these deep-value growth stocks. Year to date, Cypress' revenues are up 7.1% compared with the first half of 2017. 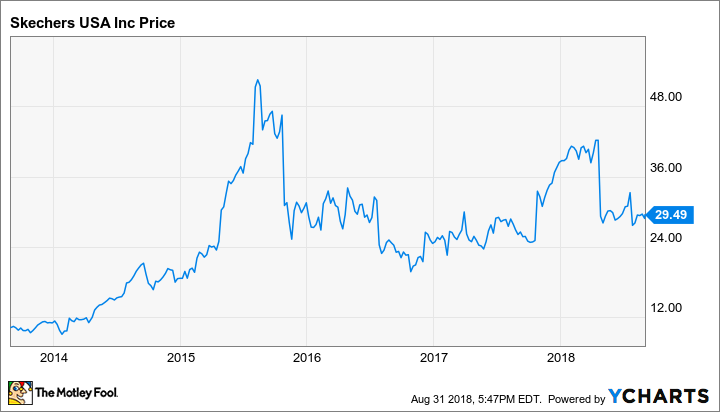 The company just recently returned to profitability -- posting $0.10 in earnings per share after two quarters in 2018 as compared to an $0.18 loss last year -- as is reflected in its 12-month-trailing price-to-earnings ratio of 356. When using 12-month forward expected earnings, the stock's price to earnings is a mere 10.8. Price to free cash flow -- money left over after basic operations and capital expenditures are paid for -- is only 13.8. Todd Campbell (Teva Pharmaceutical): Teva Pharmaceutical's investors suffered setbacks following the company's nearly $40 billion acquisition of Allergan's (NYSE:AGN) generic drug business; the launch of a competing biosimilar to its best-selling drug, Copaxone, by Mylan (NASDAQ:MYL); and pushback on pricing. However, there's reason to believe this company is worth adding to portfolios. The company's price-to-book and price-to-sales ratios remain near their lowest levels since 2000, despite a recent run-up due to Warren Buffett's Berkshire Hathaway (NYSE:BRK.B) buying shares.